Last edited by Wickkedkid; 10-29-2018 at 11:32 PM. There is something wrong with your ports in the worldserver configs i am willing to bet. Hi worldserver.exe close after starting, how can i launch it ? The Worldserver.exe crash, i think that it can not conect with the database and it close the .exe. "Could not prepare statements of the Character database, see log for details." The problem to the new Worldserver.exe is in Updates of DBs. The database is old to this new worldserver.exe somebody update the ashamanecore database. Last edited by yuniorvoltes; 11-14-2018 at 08:26 PM. 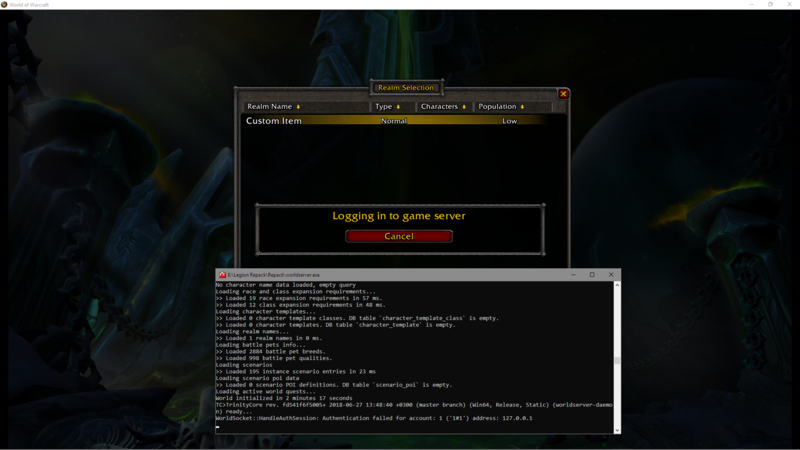 Please place VMAP-files (*.vmtree and *.vmtile) in the vmap-directory (D:\Archimonde/vmaps/), or correct the DataDir setting in your worldserver.conf file. Unable to load critical files - server shutting down !!! If someone can help me, to fix it, im realy appreciate your help. World of Warcraft: Battle for Azeroth 7.3.5(26972) Please upload the client file. how to install the repack and how to make the server and how to make one account ? hello im new and im not understand how to install the repack and how to creat the server and creat the account too so i ask if here one video or a screanshots for show how to install the repack step by step and sorry for my bad anglish please . Does anyone know of an alternate place to download that client? I am having little luck finding it online. I will keep searching to see if I can find it, but I figure i'll ask here just in case someone already knows of a better way. Which is more better overall? MMOPro or Single Player Project - AshamaneCore (Legion)'s repack ?